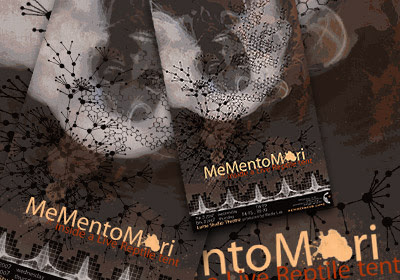 From January to March 2007 at Media Lab we planned (and built) a live performance event utilizing interactive narration in spatial design, under the theme "Live Inside a Reptile Tent", later renamed "Memento Mori". This project went towards the more artistic side of the Media Lab. The end result show was presented at the Lume Studio Stage on the 7th and 8th March 2007. 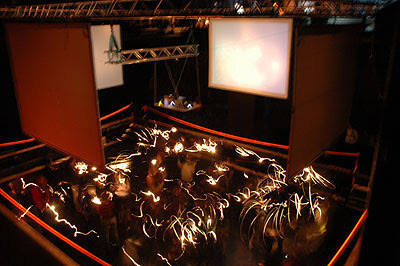 The aim of the event was to recreate an electronic freak-show experience. I also made an autonomous blog that documented the evolution of this project on a daily basis. Concept development, live-performance, interaction design, staging, narration, set design, production management. Later that year I took the project as a study case for my New Media Management courses, and did the Work Breakdown Structure for the whole process. Heikki Ryynänen, Pii Paappanen, Atle Larsen, Anna-Maija Kesonen, Diana Sousa, Katarzyna Miron, Tommi Horttana, Viara Gentchev, Antti Mäki. Dr. Chris Hales PhD., Jukka Ylitalo, Teijo Pelinen, Jouko-Thomas Kleine, Pipsa Asiala. Ilkka Riihikallio, Tero Vesterinen, Pekka Salonen, Heikki Niiranen, Tuukka Teponoja. Diana, já reparaste que o nome deste teu blog, se escrito rapidinho e suprimido o 'so' transforma-se em dianadeusa!! Cheguei a ti através de uma amiga portuguesa que conheci em Oulu, é arquitecta e chama-se Cláudia. Acho que vocês têm amigos em comum em Helsinki. Fiz Erasmus o ano passado em Kuopio, portanto conheço bem a realidade finlandesa. Acontece que este ano candidatei-me ao mestrado de design industrial na TAIK. Onde penso que ainda te encontras, certo ? Welcome to Canton Chair Rental. Whether formal or informal, strictly business or mixing business with pleasure, your meeting or special event is in good hands with us.